"Nobody else will want them let's face it." I happen to vehemently disagree with this statement made by a friend yesterday when we were discussing recording our memories. She has cleared the decks at her house so there will be no "rubbish" left for her children to deal with when she leaves this mortal earth. I was telling her that I was finally going through and tossing 35 years worth of tickets, pamphlets and programs from 35 years of overseas travel..... BUT before I tossed them I scanned all that could be scanned. I am going to put all of those digital images on my hard drive in the photo folders to which they relate. I'm sure some of the kids will enjoy them. Of course I have saved hard copies of some important documents like the luncheon menu from when I dined in The Strangers' Dining Room at the House of Commons in London. I have a bad case of Hoarditis and find it difficult to part with ephemera but I just don't have the physical space to store it all. Although I have transcribed all of the entries in them into my online diary I still have a collection of my old physical diaries. Today I took a giant leap forward and tossed out all my old work diaries (I have been retired for nearly 7 years). I don't think I'll be quite brave enough to part with personal diaries ....just yet. Maybe nobody else will want them but I'm giving my descendants the option of saying Yes or No. Will you leave plenty of memories behind? I am a winner because I am off to Rootstech in 2016. Although I have attended this event several time its gloss does not lose its sheen. I get to meet old friends, make new ones, hear some world class speakers, interview some interesting folk and, if I can spare the time, do some research in the Family History Library. Additionally I have been selected as both a Rootstech Speaker and a Rootstech Ambassador - that will make me doubly busy but will bring more than double the fun. I have been given the graveyard shift on the Friday for my panel session "GS2384 - Dealing with Ethical Dilemmas in an Online World" where I will be joined by some fellow Genealogy Rockstars. It is excitiing to see my Speaker Bio (we had to make them short) online. The Ambassadors' bios are yet to come. You can be a winner because, as one of my Ambassador perks, I have a Rootstech Registration to give away. In the next few days I'll think up some sort of simple competition for my Rootstech Giveaway. Watch this blog for further details later in the week. We are regularly advised to return to online sources such as Trove and redo our searches. I certainly remind people to do this when I am giving presentations. So I am about to practice what I preach. My maternal grandmother's maiden name was Pusell and I believe that nearly everyone with that surname is a descendant of my convict ancestor James Pusell. I 'll do a simple search for Pusell and see if it turns up anything new. The first article is a wedding report for Mum's second cousin, Horace Keith Pusell. It gives me plenty of new information to add to my Family Historian database. 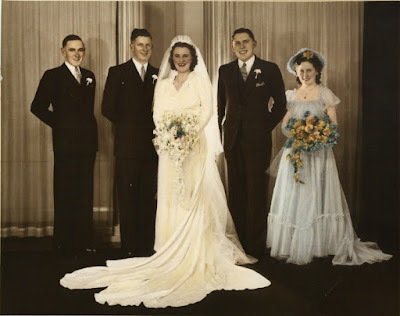 The second entry is another wedding coincidentally it is for Keith's sister, Kathleen Mavis Pusell, to Ronald Collins and it is from the same newspaper "National Advocate (Bathurst, NSW : 1889 - 1954)" which I assume has been recently added to Trove. I had previously seen the next few entries on the list but this one from the National Advocate about Terry Pusell was new to me. I wonder if it is the same Terry Pusell that was an Altar Boy at Keith's wedding? The next article from 1926 about Mum's first cousins comes from another newspaper, "Mudgee Guardian and North-Western Representative (NSW : 1890 - 1954)". What I found is that ten of the twenty hits on the first page of results for my Pusell search were new. Last year when reading a post, My 20 years on the Web (1994-2014), from Jane Hart , one of the Educators I follow, I made a note to myself to recognise my 20th anniversary on the internet. On 26 and 27 September 1995 I attended a course on using the internet in education that started me off on my love affair with the internet and since that date I have been faithful. For twenty years I have used the internet on an almost daily basis. I first started using the internet from home on a dialup connection with a Toshiba laptop in 1994. In addition to personal playing around I became a volunteer for Studentnet, an initiative of The Association of Independent Schools iof NSW. I was responsible for the primary english part of thier website that provided links to suitable internet resources for students in our schools. I had a great time finding and reviewing sites. Working as a teacher/librarian with responsibility for IT I had many opportunities to indulge in online activities. Working in one of Australia's first laptop schools allowed me to share my enthusiasm for technology with some keen students. I integrated technology into my teaching at every opportunity. Looking at some of the websites I created in the early days of the internet dredges up lots of memories. I am so annoyed that I cannot find a copy of my first family history site "Jill's Jigsaw". I deleted the first blog I made for Teacher Librarians in 2003. I did not make that same mistake with TLNewsau started in 2005. I have continued to blog over the last ten years and hope to continue doing so for many years to come. My post is a little late today as it's school holidays in my neck of the woods and I have been involved in grandmotherly activities. Now that I'm back from a 4 hour round trip to see two of the youngsters perform in a concert I can switch my focus from the furutre to the past. Thansk to Shauna Hicks for her mention of GeniAus' Gems in her Diary post this week - I am sure it drove some readers my way. This week one of the posts I read stands out because it was the result of of thought, analysis and testing on the part of the geneablogger who wrote it. Recently I wrote a post "http://geniaus.blogspot.com.au/2015/09/please-make-me-think.html" - that's what Shelley's post did. 1. The top post (IMHO) this week is one of a series of three witten by my mate Shelley in the ACT. 4. Kerrie, ne of my former colleagues in education loves reading too. How are you progressing this year? 5. Laurie is an author I met at Hawkesbury Library. She poses an interesting question here. 10. Scandal in Sharon's family? I am excited to be returning to The Hawkesbury Family History Group Meeting on October 14 to present a new talk "Do the right Thing : minding your manners in the geneasphere". The Group has advertised the talk "as a fun and informative look at the principles of doing the right thing in family history research" so I will try to take a lighthearted approach to the topic. Although I am not an etiquette expert I look forward to exploring the topic with the folk in the Hawkesbury group. As someone who has been guilty of several breaches of etiquette as I have navigated the geneasphere I have a few personal examples that demonstrate what not to do. The powerpoint slides all have their headings, I just need to flesh it out with a few appropriate images and a little text. If you'd like to join me at Hawkesbury Library in Windsor at 10:00am on October 14 you would be most welcome. 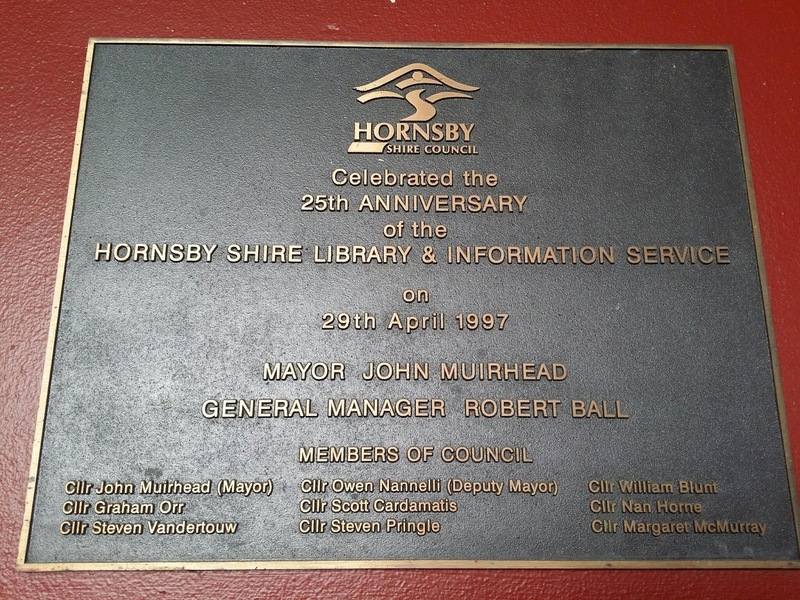 The library has an excellent Local and Family History collection where you can linger after the meeting. I can't believe that the gig is three weeks away and that I am well advanced in my preparation - perhaps I am heeding my own message to "Do the right thing". Just in from the Rootstech Organisers. Have you some family footage you can share? Be a Part of the RootsTech 2016 Kickoff Video! RootsTech, hosted by FamilySearch, is the largest family history conference in the world. It is the perfect place where people of all ages come to discover, preserve, and share their family connections and stories across generations—past, present, and future. RootsTech is the ultimate family celebration. This year, RootsTech wants to share what draws families together by compiling clips of your family videos and photos. Selected footage from those who submit will be used to create theRootsTech 2016 Kick-Off Video, and shared with families from all over the world during the event on February 3–6, 2016. Also, one lucky submitter will win a full RootsTech 2016 conference pass worth more than $200! Click on the link below to learn more. When using the mobile Blogger app to publish a quick blog post I sometimes make a silly mistake and publish to the wrong blog. Yesterday I did it again and published to my personal blog. Will I ever learn that I must take more care when posting from my bed late at night? It was just a lighthearted observation that I will repost below. Just came across this tissue pack that was among the delegate goodies in a conference bag earlier this year. 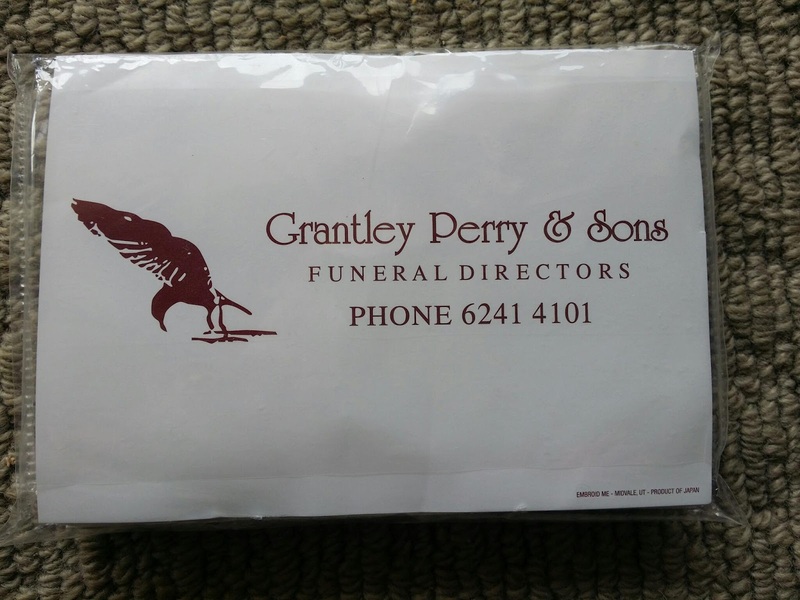 What does it say about the demographic of genies when a funeral director is a conference sponsor? This is not really about genealogy but the product in question is a great tool for the genealogist. Whilst I use Librarything to record all the books (including genealogy ones) I have read and those I own that are still to be read I have always wished that I could record the movies I watch in a similar program. I have dabbled with a few other options but I prefer Librarything. I just about danced for joy when on their blog last week the good folk from Librarything annoounced on their blog that they are bowing to the wishes of their users and making it possible to search a few online music and movie catalogues to add details of these works therein to Librarything. So in between backing up my genie files to a couple of hard drives today I did a search of my diary (it's an excel spreadsheet) to find any entries with the word movie in them. What is scary is that I can't remember half of the first 20 movies I found. It only takes a few seconds to find the movie from the Amazon (UK) catalogue or whichever catalogue you nominate and zap them into my Librarything account. Once that is done I can add ratings, reviews and tags just like I do for my books. I could even do it for my music if I felt inclined. Today we are remembering Mr GeniAus' parents, James William Ball and Daphne Williamena Edith Gillespie, who were married at All Saints Church of England, Petersham, NSW, Australia 74 years ago at 3:00pm on September 20, 1941. I am thankful that this union took place because it gave me my dear Mr GeniAus. I had a beaut trip to Port Macquarie this past week where I attended the Annual Conference of The NSW & ACT Association of Family History Societies Inc. On our way back to Sydney we visited Mr GeniAus' 1st cousin once removed to fill her in the recent reseaarch we have done on the Ball line. She had many laughs when we related some of the family stories we had found on Trove. Hearing those stories prompted some pithy comments from her aboutsome of the ancestors. I'll add them to my database but might mark them as private! 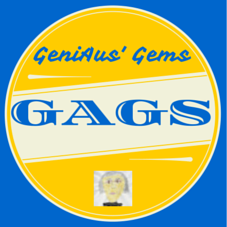 I just noticed that my GAGs badge tones in with my new blog look. I pimped my blogs this week too. I've had more time for blog reading this week so my selections will stray from Australia and family history. This collection is subjective as inclusions are influenced by my emotions and environment. 1. A question we are often asked. Lynda answers. 2. Tanya discovers the truth about a potential swimmer. 6. On my gunna list was a report of the Port Macquarie Conference but Shauna has done a such a beaut job I don't need to. 7. I love libraries and so does Yvonne. 10. Sherie comes face to face with a convict ancestor. 11. We can't get to every event so thanks Lenore for arranging a virtual visit for us. 12. Moya talks about a new way of displayong your family history. Why doesn't Ancestry do this? I just received the message below from FindmyPast. It is pleasing that, when they give something to those who are not subscribers, they follow up with a sweetener for those of us who are loyal subscribers.. I wish Ancestry would follow suit. A couple of weeks ago Alex Daw challenged geneabloggers to Pimp their Blogs. I praised the idea, committed to some pimping and then got caught up in other geneamatters. Yesterday I received an award that came with a sparkly new image I wanted to add to my blogs, so instead of dealing with the mess around me this morning, in a fit of vanity I added the image to three of my blogs. While I was over at Wordpress I added and removed some widgets to The GeneaDictionary and CurryAus, the changes aren't great but they are an improvement. When I got here to Blogger I looked at my header and decided it was time for a change. That old header contained an image of leaves (related to trees) and the title and subtitle of the blog but it didn't say much about me and I was getting sick of green anyway. I spent way too long over at Canva creating a new header using a favourite photo of mine from this year. It's not a fancy photo (try lining up 11 kids who are desperate to eat the treasure they found in the family Easter Egg hunt) but it means a lot to me. The subjects are my 11 grandchildren who are very precious to me; having a photo of youngsters reminds us that I not only look to the past but I look towards the future; it says something about who I am and about the people around me. I'm not 100% happy with the new header but I couldn't spend all day on it. ; I need to chase up more ancestors and their stories to share with my little people. While I was pimping I got rid of a bit of green and substitued it with blue, a colour I prefer. I moved my widgets around but couldn't bear to part with any of them. I also spent some time updating my Pages which were crying out for attention. So my blogs have had a Spring Clean - thank you Alex. Earlier today I received an email from John D Reid which stated "Congratulations. Your genealogist colleagues have voted you #1, gold award, superstar genealogist for Australia/NZ for 2015" and a request that I keep the news embargoed until the Official Announcement went live. Keeping mum has been difficult as I was rather excited to read the news in John's email. Having managed to contain my excitement for several hours I am now able to share the link to John's Golden Announcement. Congratulations to all those who received awards and to all those who were nominated for this award, to be included on this list is a golden achievement. That my name came out on top in Australia/New Zealand is a wonder to me. I am so proud to see my name on the Golden List with CeCe Moore, Dave Obee, Kirsty Gray and Claire Santry. I thank all those Genimates who voted for me in this competition and John D Reid for organising this activity which does much to promote genealogy and genealogists internationally. I recognise the multitude of volunteers who work in genealand and provide resources and services that help people like me reach Gold Status. As I proudly accept this award I will remember all those Golden Genies on whose shoulders I stand. I must confess that I am a bit of a geneaconference junkie. I love going along to events where I can meet up my genimates in the flesh and hear their news. I also go along to learn. I hope to be informed, entertained, inspired and challenged. I want to hear presentations that challenge me to think about new ideas and issues. Sometimes I come away disappointed. Whilst I learn something from every presentation I attend I want and need more. I understand how difficult it is to create a conference program that caters to diverse needs but I sometimes wonder why some program developers concentrate on presentations that inform and entertain attendees and steer away from the inspiring, challenging and controversial. We are more than empty vessels waiting to be filled. While I am on my hobby horse may I also remind program people that we are well into the 21st Century and presentations that discuss issues around technology are also appropriate. This little rant is a plea to those who prepare programs for events to consider the types of presentations they include in their programs and to include a few talks that will give our gray matter a workout. I believe that Rootstech Registrations will open today, 15th Spetember. (US time). As a Rootstech Ambassador I have a Free Conference Registration to give away. In the next few weeks I will be announcing a competition for this prize so watch this space. Submissions for the 2016 Innovator Showdown are now being accepted! FamilySearch International is looking for the next big innovative idea that will impact not only an industry worth billions, but also generations of families—past, present, and future! The 2016 Innovator Showdown will be held in conjunction with RootsTech, happening February 3–6, 2016, at the Salt Palace in Salt Lake City, Utah. The Innovator Showdown will be a global innovation competition for developers and entrepreneurs seeking an opportunity to impact the growing family history industry while competing for $100,000 in cash and other prizes. Innovators in any industry that have solutions directly or indirectly related to family history are invited to enter the showdown. Click the button below for showdown details and to enter. Submission portal closes December 1, 2015. I look after the website for our very new local Family History Group. Tonight at the Annual Conference Dinner of the NSW and ACT Association of Family History Societies Inc our Group received The Dorothy Fellowes Website Encouragement Award for a website administered by a society member. As our Group’s media (and website) person I was thrilled that I was in attendance at the dinner and able to collect the award on behalf of our Group. Congratulations to our northern neighbours, Wyong Family History Group, a group with a long history who won the major award. I was so proud that our efforts as a new Group were recognised with this Encouragement Award. That our Group that has only been in existence for seven months received recognition for our efforts is most pleasing. 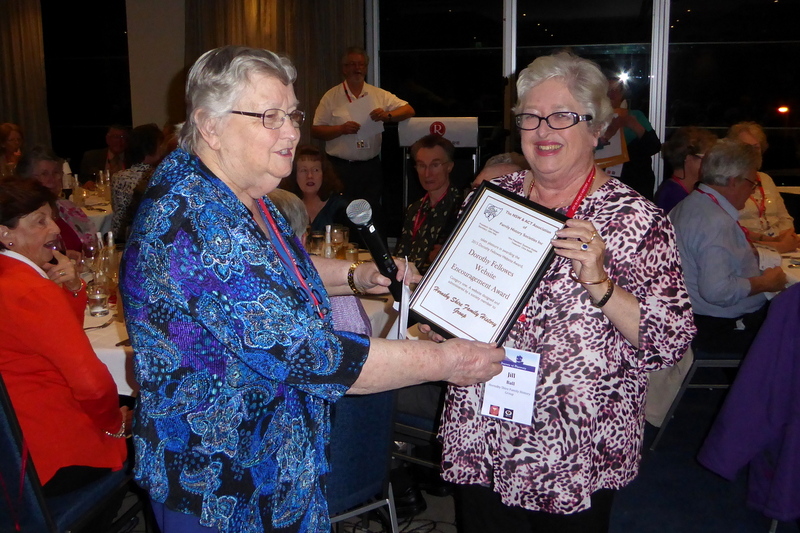 Jill Ball, Media Officer, Hornsby Shire Family History Group receives our award from Dorothy Fellowes. Today I'm reporting in from Port Macquarie. I have spent the day at the Family History Fair which precedes the Annual Conference of the NSW & ACT Association of Family History Societies Inc. I had a beaut day catching up with many genimates and meeting some genies previously unknown to me. The social aspect of these events cannot be underestimated. Following please find links to some of the (mainly Australian) blog posts I enjoyed this week. 1. How does your bucket list compare with Jennifer's? 6. Family History Mysteries at the National Library. 7. Sharn shares exciting news. I have returned with Mr GeniAus to a place where I spent many summer holidays as a child and that later we brought our children for summer holidays. I have many fond memories of summer days spent in this coastal retreat. Port Macquarie on the mid north coast in New South Wales is a popular destination for seaside holidays and a home for retirees seeking a mild climate away from the madness of big sities. When it was announced that Port (as the locals call it) would be the venue for the Annual Conference of the NSW & ACT Association of Family History Societies Inc. I convinced Mr GeniAus that we would need a break by the sea in September 2015. .. and here we are. Today it took us about four hours to drive up from Sydney on a good straight highway most of the way. I seem to remember that it took much longer when I was a child as we had to negotiate the old Pacific Highway with its many twists and turns. I can remember the car radiator boiling over on Buladelah hill. 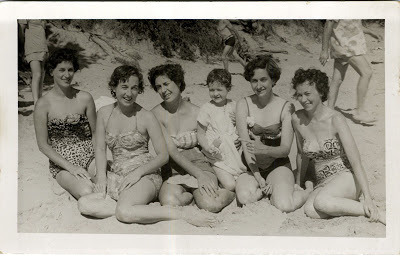 We are presently settled in a comfortable waterside hotel in Port Macquarie; when I was a child we rented a small two bedroom flat (away from the action) in which Mum, Dad and my aunt, uncle and cousin would spend two weeks. Although our accommodation in those days was very basic I have wonderful memories of times spent on the beach, fishing in the river and visiting the various tourist attractions in the area. As we arrived at dusk I haven't had time to explore these old haunts but will do so after the conference concludes on Sunday. Meanwhile I am excited about manning a stand (with Mr GeniAus) at the Family History Fair tomorrow for The Hornsby Shire Family History Group and representing them at the forum and annual general meeting of NSW & ACT Association of Family History Societies Inc. As this is a first for me it will be a new learning experience. I have already met a couple of genies in the hotel and I bumped into Shauna Hicks and Max on our after dinner stroll. As much as I love the online world I enjoy catching up with my genimates in the flesh, I am particularly excited about meeting some online friends that I have not yet met in person. 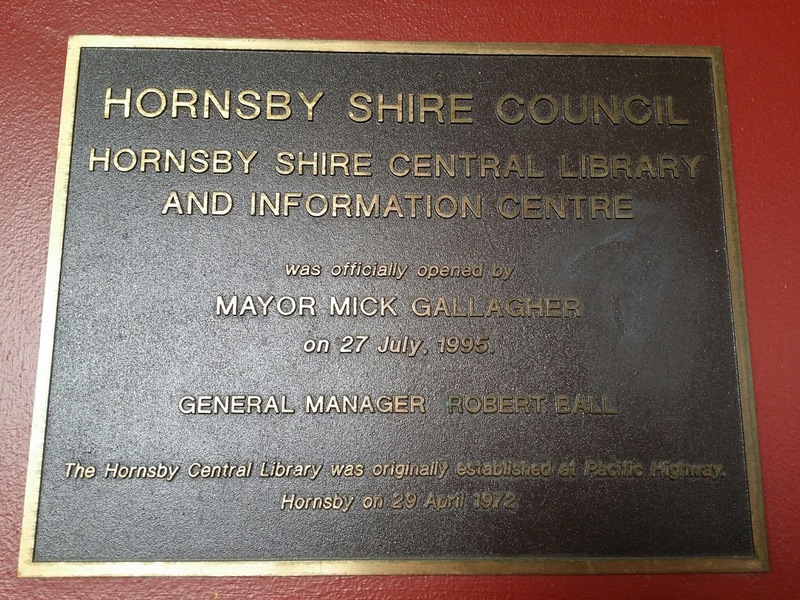 I found a bit of Mr GeniAus' family history at the local library today. When I go to genealogy/family history conferences in Australia I like to carry on a tradition started by Mr Geneablogger, Thomas MacEntee, and embracd by DearMYRTLE. That is the distribution of Blogger Beads to geneabloggers who are attending those events. Next week The NSW & ACT Association of Family History Societies are holding their Annual Conference in Port Macquarie. I'm wondering how many other Geneabloggers are attending the conference. Should I bring along my bag of blogger beads? Will you wear them? Can we make a time for a group photo? If you are a geneablogger attending the Conference and would like a set of beads to wear please let me know via social media or email jillballau@gmail.com You will be able to find me on Friday at The Family History Fair manning (with Mr GeniAus) The Hornsby Shire FHG table. As many of you know I also blog in some other places. This morning I was excited to discover that two of my blog posts rated a mention on Jana Last's Follow Friday ~ Fab Finds for September 4, 2015 list. On the occasions I find the GeniAus blog on Jana's list I always get a thrill, it's affirming to find tht a blogger of Jana's stature appreciating something I write. Todays's mentions were for posts on two other blogs. The first mention was for "To Pin or not to Pin ... by Jill Ball for Worldwide Genealogy ~ A Genealogical Collaboration". I am a proud member of the group of genealogists from several nations who contributes a regular post to this blog. The second mention makes me especially proud. I am the media person (website, blog, communication) for a new family history group that was established in February this year. 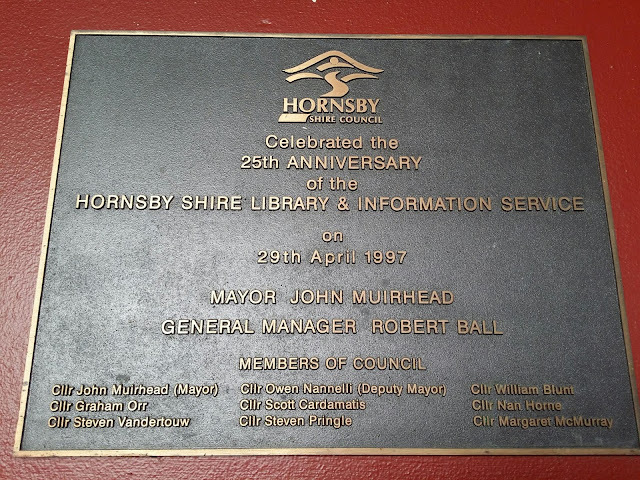 Having Jana mention the post "Download Free Genealogy Guides by Hornsby Shire Family History Group" will bring some new readers to our blog and promote the work our fledgling group is doing in our area. I cannot wait to meet Jana in person at Rootstech 2016 and thank her personally for her mentions. It's been a big geneaweek for GeniAus this week with last Sunday's GeneaGala series of Hangouts on Air. After a day off genealogy last Monday I returned to my blog reading and selected some posts that I hope you will enjoy. I seem to have bookmarked a few foreign posts this week. 2. Remember to nominate your fave genies and vote after September 7. 3. I'd love to see more Book Review posts - here's one from Liz. 4. Shelley puts her analtyical mind to work to come up with some super and unique advice for searchng Trove. 5. Amy, my genimate from Texas, is writing an hilarious personal blog. 6. Meet Malcolm from the Biographical Database of Australia. 7. From Lithuanian Jew to Catholic Priest. 10. Do you use the digitised books from Familysearch? As I am wanting to keep the #trovetueday activity alive and the hashtag relevant I am posting something from our Nation's Treasure Trove today. Genealogists turn to Trove for newspaper articles but Trove can lead us to many more resources. When I logged on this morning I didn't know what I'd search for but then I thought about Pandora, Australia's Web Archive, that is searchable via Trove. I know that my blog and those of some of my Genimates like Shauna and Pauleen are archived by Pandora. I wondered what results a simple search "family history" would return in results from Pandora. I got an incredible number of hits, the results telling me there were "at least 1,216 sites containing 793,414 page versions". That's quite a bit of material on family history. Then I started thinking about my ancestors and wondering if within those results I might find something new about them.....and I did. I often use the surname Pusell in my searches as anyone with that name in Australia is related to me. So I added Pusell to the search string. The results can be seen below. The first link was to my blog but the second and third were new to me and haven't turned up in the previous Pusell searches I have done on Google. The third result was the most exciting for me as it took me to a blog I didn't follow (now rectified) that contained a very sharp image that included my Grandmother's brother, James Pusell, and his son George Pusell. The blog, Old Images of Rylstone District, that aims to "share historical information depicted in photos and images of old scenes of the Rylstone District" has a collection of 690 images. In the photo I found there are some chaps named Cole. As James Pusell was married to Annie Cole I suspect that these men may be relations. I need to investigate the second link as I don't know of a Samuel Pusell!!! I hadn't thought of the Pandora Archive as a potential source of ancestor information. I have been enlightened on this Trove Tuesday. Now I need to spend some time constructing search strings for my ancestors with pesky names like Curry and Smith and also to search for articles on ancestral towns and villages. After one of his career triumphs Australian World Champion Boxer Jeff Fenech uttered the immortal words "I love youse all". I am borrowing Jeff's phrase and sending it out to all those genimates who supported me in my crazy Sunday GeneaGala Day of Google Hangouts on Air. I had the most awesome time and thank all of you for being there with me. There is not way I would have made the Finish Line without the support of my genimates DearMYRTLE and Cousin Russ who are Hangout on Air experts. Thank you for staying with me and providing moral and technical support during the wee hours (in your timezone). Your generosity knows no bounds. How can I ever thank you? 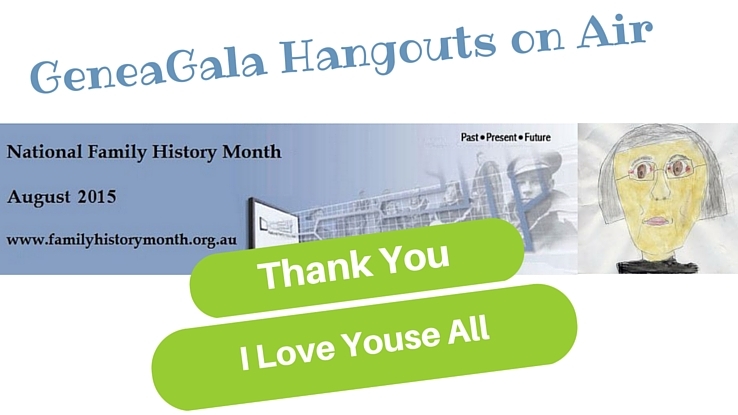 We all did our bit to support National Family History Month downunder. If you wish to see the Hangouts you can view them via the GeniAus Community on Google+ (you need to join) or on my Youtube Channel.